Unfortunately, the Veterinary Medicines Directorate contacted me to tell me it was against the law to advertise this wormer since it was classed as ‘Prescription Only Medicine – Veterinarian, Pharmacist, Suitably Qualified Person (POM-VPS)’. and that ‘Products classed as POM-VPS can only be advertise in publications aimed at professional bodies and not to the general public’. I was surprised they considered this page as advertising so I spoke to them and they advised me that I should not use the product’s brand name but could say ‘A product containing Flubendazole‘. As a result, I have removed the product name. Before using medication to worm your chickens, it is best to check they need worming first by using a Worm Count Kit like this one. This is a simple test where a sample is sent off by post and the results are returned to you (usually by email) and will advise you whether or not you should worm your chickens. In the United Kingdom, a product containing the anthelmintic (wormer) Flubendazole is currently the only licensed in feed product available for chickens. It is very effective at killing worms and their eggs. 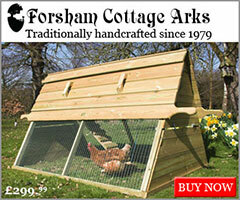 Worms can cause a huge amount of damage to chickens and cause many health problems. As a rule of thumb, if I have a sick bird, the first thing I consider is whether or not she was wormed recently before exploring other avenues because so many signs of illness can be as a result of worms. Worms lay thousands of eggs in a day that are not always visible in droppings. Eggs then either get picked up by birds scratching around the floor, eating from the ground or in their litter when housed (i.e. picked up directly) or are eaten by earthworms or other ‘hosts’ and passed on to our birds when they themselves get eaten (i.e. indirectly picked up). 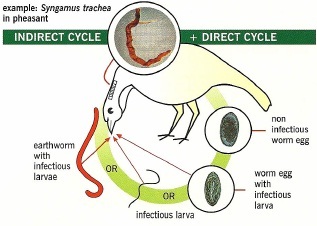 These two routes of infection are called the ‘Direct Life-cycle’ and the ‘Indirect Life-cycle’ and can be understood better from the diagrams show that are kindly supplied by Elanco (formerly Janssen Animal Health) where two examples of direct infection and one indirect are shown. Worm eggs are destroyed by heat, drought, a hard frost and UV from direct sunlight. For this last reason, I keep grass short in runs over the hotter summer months where my hens graze so that worm eggs can be destroyed. Over the colder winter months or below 10 degrees Centigrade. Worm eggs cannot mature and therefore cannot become infectious so I test my hens with a worm count kit and worm if necessary in the Autumn as the temperature starts to drop and in the Spring when worms become active again. This product containing Flubendazole that I’m not allowed to name is very effective and after the recommended 7 day treatment, chickens are free of worms and eggs. 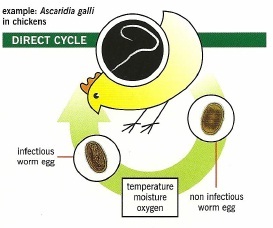 One thing to remember is that the thousands of eggs deposited via droppings (or coughed up in the case of Gape Worm) are still present in the environment so if the worm infestation is bad, you will need to repeat treatment after 3 weeks to break the cycle before the newly acquired worms (picked up from the eggs) have a chance to mature and lay eggs themselves. 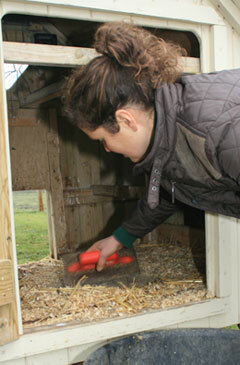 The withdrawal period stated on the tub is nil for eggs from laying hens. This means that you can continue to eat eggs whilst your chickens are being wormed. I’m sure you won’t be eating your hens but they must not be slaughtered for human consumption during treatment. Treated birds may be slaughtered only after 7 days from the last treatment. 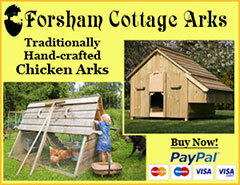 If you have a small flock, there is a 60g pack sufficient to treat around 20 large chickens. This comes with a handy little measuring scoop so that you can get the quantity right. 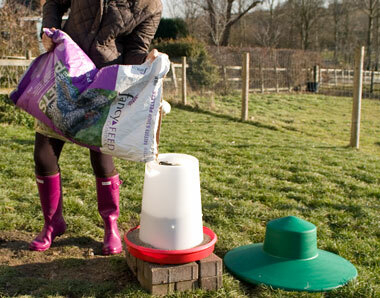 One 6 g scoop treats 2 kg of food for chickens. This is the simplest way to worm and if you mix it as I suggest above with a little oil, you can be sure your chooks are getting the required amount. There is also a 240g tub or gamekeeper pack which is more suited to 50 birds or more and lasts longer. Because of the tight regulations and a license that sellers need to hold (costing over £600 I was told by one company), both of these products are becoming harder and harder to buy. I bought a 60g tub in 1998 and paid £12.50. A year ago I bought another one and it was £70! Serious money. The product containing Flubendazole can also be purchased pre-mixed in layers pellets on websites such as Amazon in 5 or 20Kg bags which is handy if you don’t want to mix it yourself. I haven’t seen many places selling this product containing Flubendazole online and vets don’t usually stock it unless they specialise in poultry. The ‘regulations’ are pushing people to go to their vets or other suitably qualified people yet in fact if you chat to chicken keepers, they are being offered offer other large animal wormers containing Ivermectin instead that are often bought in large packs for use on farm animals. 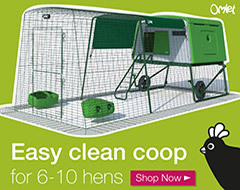 These haven’t been tested on chickens so you end up with vets advising anything from a 7 to 30 day withdrawal periods for eggs (depending on the view of the vet of what will be ‘safe’) and although this is perfectly legal, my personal opinion is that this is wrong when there is a tested product available. If you but the pack or tub then it will come as a powder that must be mixed with your chickens feed. In order to get this to stick to my layers pellets, I mix it in a small tub with a little Olive or Cod Liver Oil. 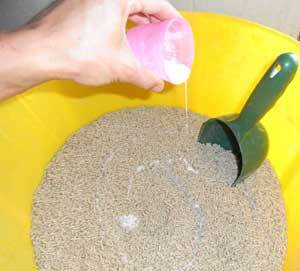 The ‘paste’ that this makes can then be poured over the right amount of (weighed) pellets in a bucket and mixed well. It sticks to the pellets and won’t fall to the bottom of the bucket like I suspect some of the powder would without the oil. Remember to wear disposable gloves for safety (yes I know we forgot in the photos!) and follow the ‘operator warnings’ given by the manufacturers below at the end of this page. Remember to dispose of empty containers in the domestic refuse. Used containers should not be recycled. Pre-mixed layers pellets of course are easier and layers feed lasts for around 6-8 months before starting to spoil so you can use it for further treatments during this time. As you will see from my routine list of jobs and from what I said above, I check my chickens for worms using a worm count kit twice per year as a preventative measure. Following the results, I worm if necessary but I also worm new birds that we add to our flock or if I become suspicious of worms / ill thrift. I rotate the runs my birds use so there is no build up of worms. I would suggest you check for worms every 3 months if your birds are on the same ground continuously. In between times, I sometimes use Verm-X and Apple Cider Vinegar to help keep worm numbers down as well as keeping the grass short in the summer months to allow UV from the sun to kill worm eggs. Can I mix Flubenvet with cooked corn, as they love it and I’d be sure they ate it then, as they are spoilt chicks and they prefer to eat there cooked corn first in morning. You could – but I would take a step back and sort out their feeding (read my page on this). The problem is, Flubenvet has been tested and is licensed to use in their feed. So a chicken of a certain weight will eat a certain amount of feed and therefore get a certain dose of Flubenvet for their weight. If you start giving it with other feeds (a popular one I read about is people using half a grape to stick some Flubenvet to which ‘makes sure’ each hen gets some) then you are taking pot luck at the dose and giving it all in one go. What if they stuff themselves with cooked corn, eating more Flubenvet than they need – can you still say you’ve no egg withdrawal period and eat their eggs? I would slowly remove all food, leaving only layers pellets for a couple of days – when they get hungry, they will eat them, then introduce the Flubenvet wormer. Hello. We worm our chickens with Flubenvet every three months and also give them Beryl’s Friendly bacteria occasionally if they look under the weather. We also give a 2% organic ACV in their water every day but we wanted to check whether this ACV could interfere with the effectiveness of the Flubenvet and/or the Beryl’s Friendly Bacteria. At the moment, we stop the ACV when we are using Flubenvet or Beryls just in case it does but wanted to check whether that is necessary/advisable and if so how long would it be recommended to stop it for? Thanks. I’ve never heard of any problems. ACV and Beryl’s supports the gut so I don’t see any issue. 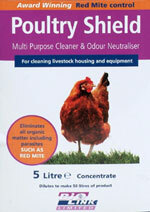 Follow the advice on the pack – it is made up with a certain quantity of feed and one 60g pack makes enough for about 20 hens. If not, you can buy 5Kg sacks of pellets – if you know how much they eat in a week (remove other food during this time), then you will know how many Kg of feed you need for them. A 5Kg bag should be enough. HI, I have 15 hens and 6 pullets. They get fermented feed every morning. Would it be ok to mix the powder with their fermented feed ? I would say that they get close to 2 kilos of feed daily. I haven’t used it – but I assume it would be fine providing they eat a similar amount as a hen that eats pellets. Hi! As well as the daily mixed feed with flubenvet – Is it still okay for them to walk around in the garden and eat what nature (grass, bugs, etc) has to give or should I lock them away with no access to other than flubenvet feed? Providing they eat the pellets mixed with Flubenvet as well, you should be OK.
Are the eggs safe to eat when you are or have just wormed the girls? According to the label, there is nil egg withdrawal when used at the stated dose.